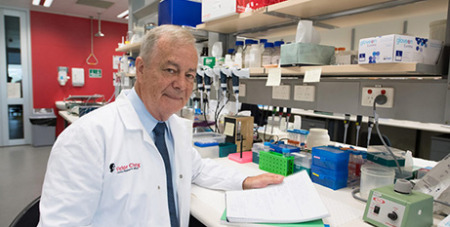 The Sydney Archdiocese has awarded a $100,000 adult stem cell research grant to Robert Graham for his life-saving research into cardiovascular disease in women. Source: Sydney Archdiocese. Professor Graham, the Executive Director of the Victor Chang Cardiac Research Institute, is one of Australia’s outstanding scientists and is working on research to determine the genetics and biology of spontaneous coronary artery dissection (SCAD) and improve survival rates of women with this life-threatening condition. SCAD - a solid swelling of clotted blood in the coronary arterial wall which can lead to heart attack - is often undiagnosed as it predominantly affects healthy women aged under 55, who are not overweight and have few if any traditional risk factors of coronary heart disease. Sydney Archbishop Fisher said the research being conducted by Professor Graham and his research team meets the highest international standards of scientific excellence. “The independent panel that assessed the applications noted that this project was likely to yield therapeutic applications in the near future and that nobody else worldwide would be able to compete with their work,” Archbishop Fisher said. “If Professor Graham’s research is successful, it would ultimately lead to the discovery of a medical therapy which could either prevent or alleviate this devastating condition. “It is important the Catholic Church shows its support for ethical medical research which is respectful of human life and which offers real hope to those who are suffering. Professor Graham said that while we understand more now than ever before about cardiovascular disease, it remains the nation’s leading cause of death and so this vitally important mission continues unabated. He said he hoped the research would give the ability to more accurately diagnose SCAD in younger women with few risk factors, and to establish guidelines for the prevention and management of the condition. Professor Graham joins a distinguished group of Australian scientists who have previously been awarded this grant from the Archdiocese to pursue ethical, innovative and life-affirming research for the benefit of the human family.